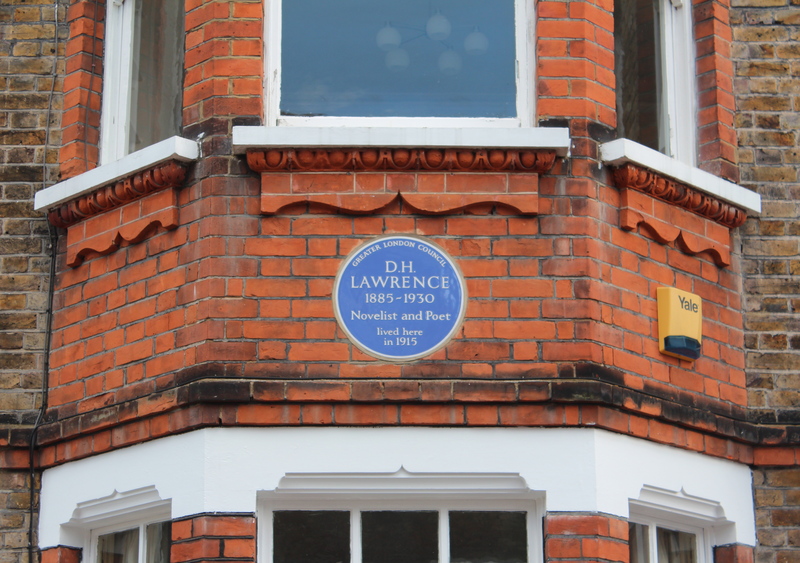 Despite its name and current rarefied status, Hampstead’s mini-neighbourhood the Vale of Health actually started life as a bog variously known as Gangmoor or Hatchett’s Bottom – and was later home to factories, fairgrounds and laundering operations. It’s come a long way since – it is now said to be one of the most expensive residential areas in the world. 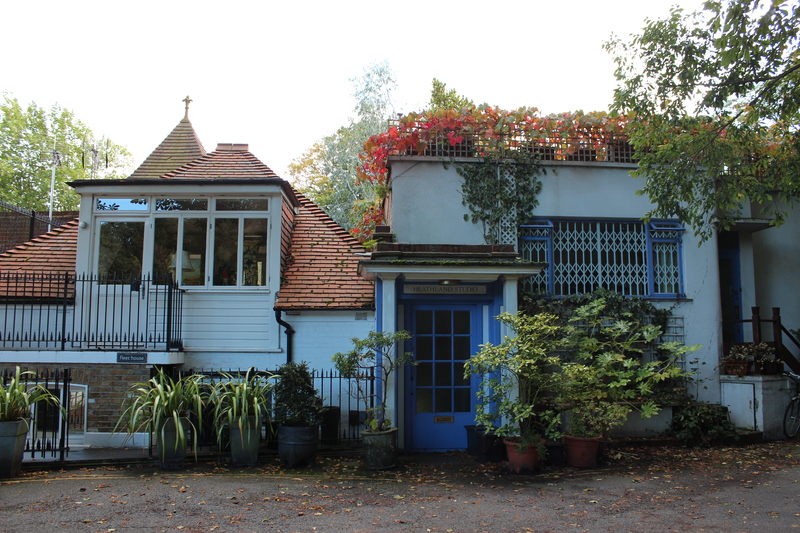 It’s certainly one of the most exclusive, being composed of just a small hamlet’s worth of houses (and absolutely no amenities) entirely surrounded by Hampstead Heath. And while its name might suggest a former health spa or some such, the reality is that it probably originated as a euphemism or an invention aimed at changing the area’s tarnished image. Please note the dog in the window. 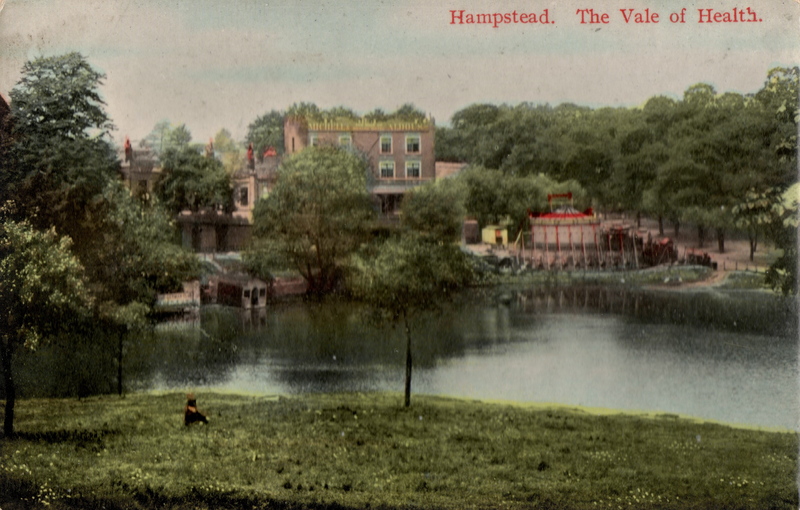 Certainly the now purely residential nature of the Vale of Health was not always so – along with the odd factory, the area was once particularly popular with day-trippers (especially after the railway came to town) and was home to tea-houses, boat rides, grottoes, arbours and a fairground. Though the merry-go-rounds and slot machines were packed away some time ago, the legacy of these more giddy days continues with the existence of what would otherwise have been one of the least likely caravan parks in London, which abuts the Vale along one edge. Today it is still inhabited by fairground employees, and has been owned by the same family for over a century. 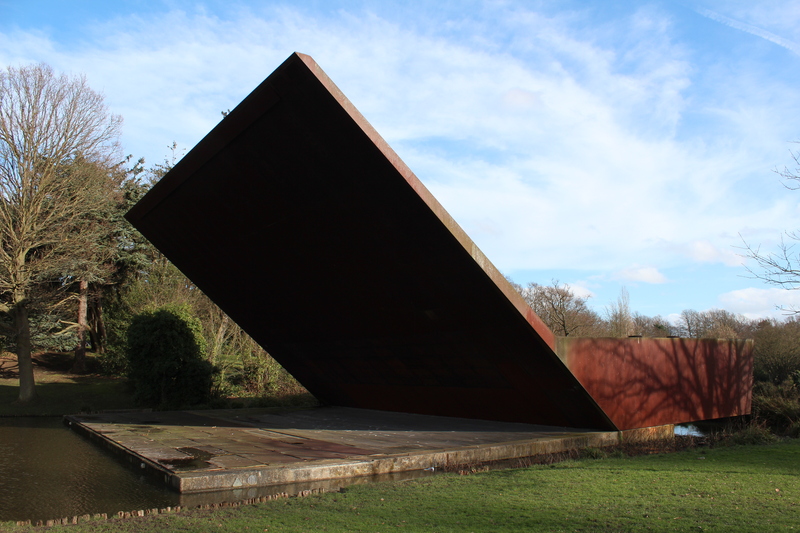 I first stumbled across the Vale of Health by complete accident while exploring Hampstead Heath. I’d remembered it as a quaint semi-village full of white houses. This recollection was only partially correct – there are indeed a number of white residences but not exclusively so and these share space with two more modern apartment buildings. 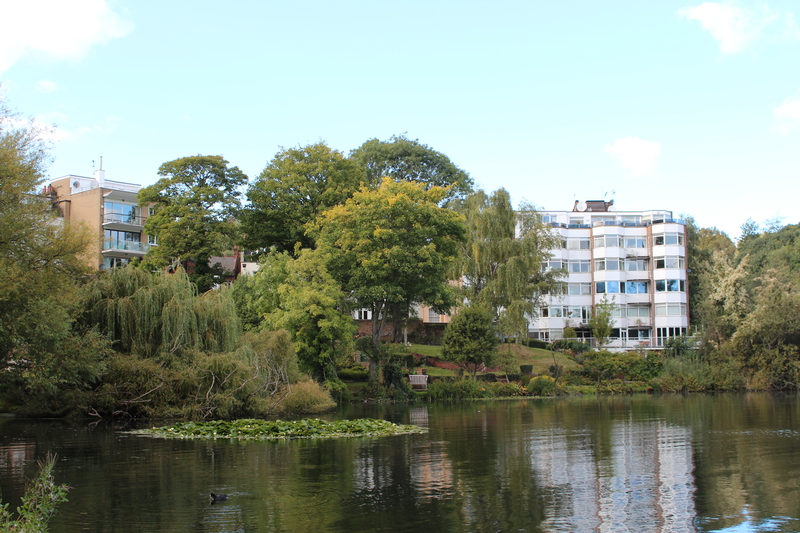 These flats were built on land once occupied by the two hotels in Vale of Health and have a lovely setting over the pond on one side of the settlement (see the before and after images below). 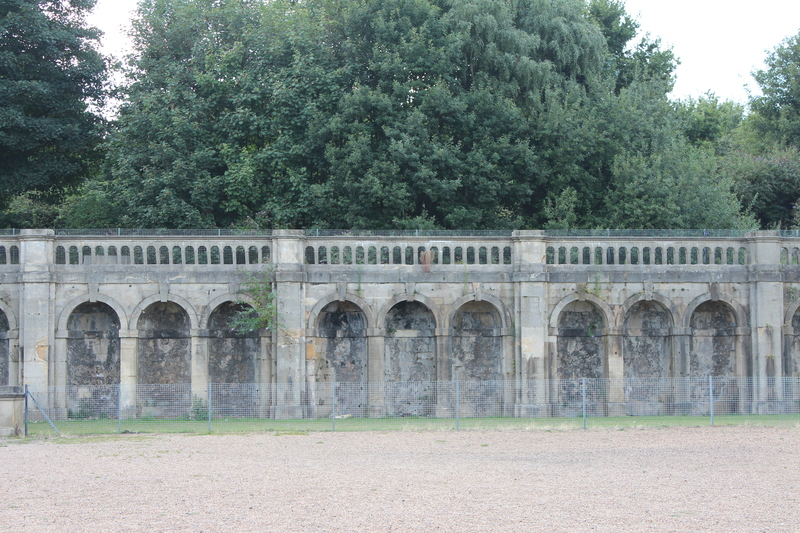 Building in the Vale was severely curtailed in 1872 when the Metropolitan Board of Works bought the heath, limiting construction to the existing area. 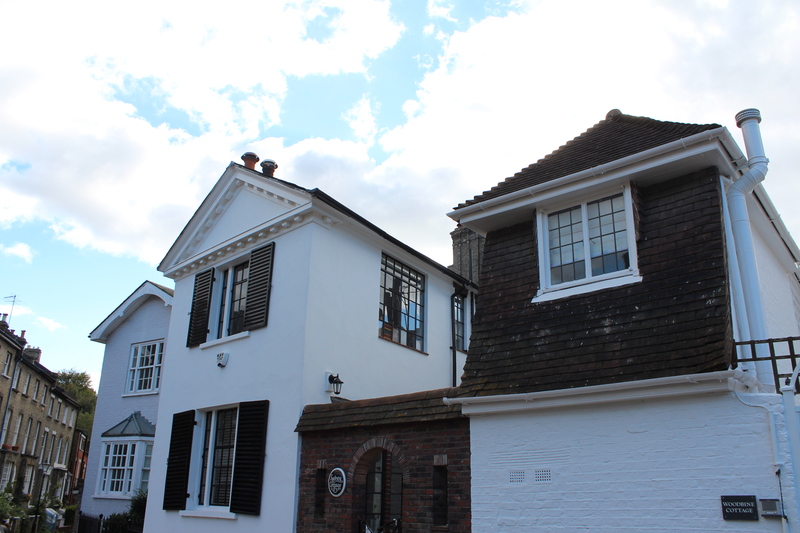 By 1890 there were 53 houses in the area – and it’s much the same today, with the residences strung out along the one main road (called Vale of Health), an unnamed side road (where the apartments are) and a series of interconnecting alleyways behind these. 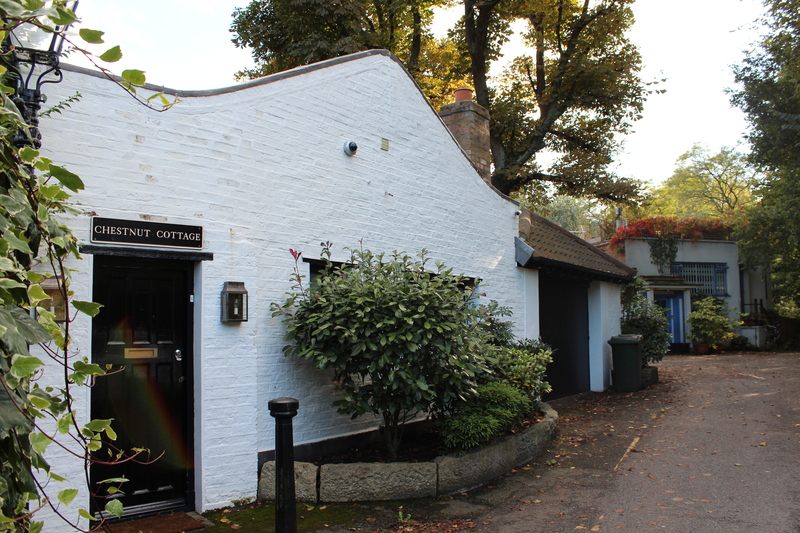 It is a fascinating little area to explore or stumble across, with an unusual history and a number of listed buildings. 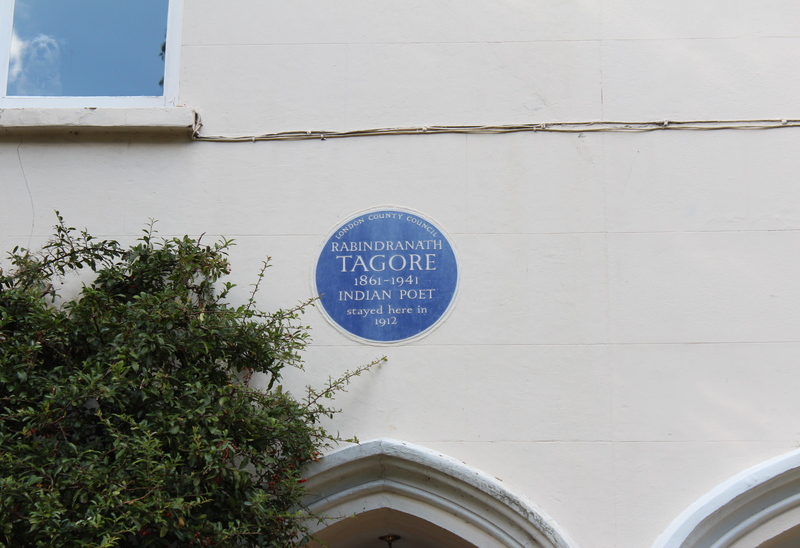 Two blue plaques can be found for previous residents DH Lawrence and Rabindranath Tagore. It’s well worth a detour when you’re next rambling across the heath. The Vale of Health can be reached via East Heath Road. 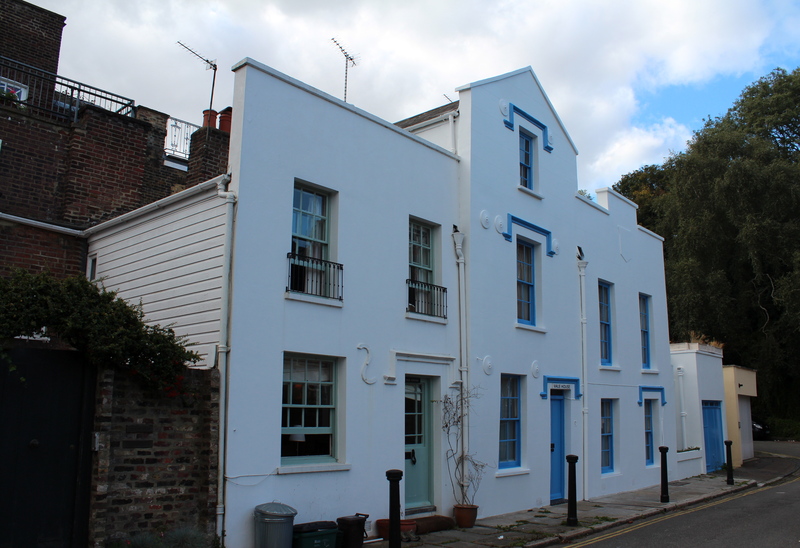 The closest tube station is Hampstead Heath on the northern line. 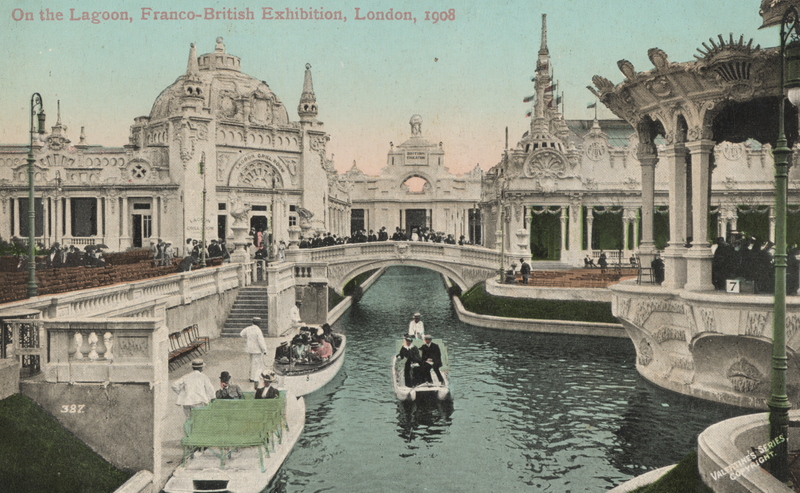 The choice of the 1908 Franco-British Exhibition as the next in the vintage postcard series is particularly apt given that it was the cards themselves – and their wonderfully evocative images – that prompted me to learn more about the event in the first place. The Londonphile is not alone in finding them to be inspiring – Donald R. Knight, author of The Exhibitions: Great White City, first became interested in the topic after receiving a vintage postcard featuring the exhibition. Knight notes that most people who visited the exhibition would have bought postcards to send to friends and family and to add to their own collection. The hobby of postcard collecting had really started to catch on at the start of the new century; twenty-two different postcard manufacturers produced cards featuring the exhibition to satisfy the high demand, with over 1,000 different cards on offer to an enthusiastic public. Valentine & Sons Ltd (Dundee, London and New York!) were the official postcard providers, and the three cards featured in this post all hail from this company. A post office was located within the exhibition in the British Industries Palace and a special handstamp created for the event; no less than four daily collections took outgoing mail to the Paddington sorting office. It's official: Valentine & Sons Ltd Official Franco-British Exhibition series. 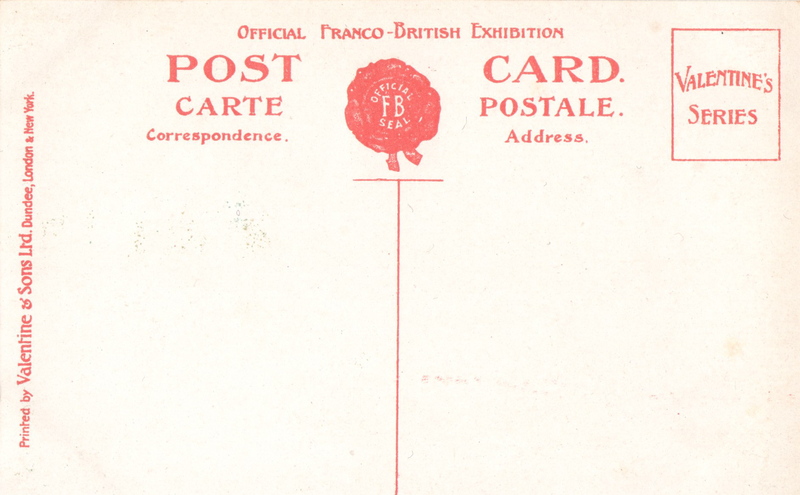 So just what was the Franco-British Exhibition? 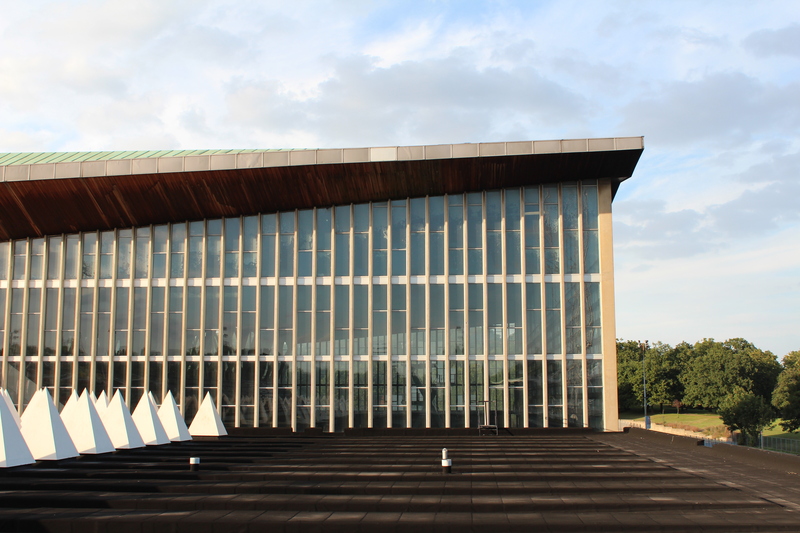 It was the first bi-lateral international exhibition, commemorating the Entente Cordiale between the two nations – essentially a large expo or trade fair to promote the products and cultures of France and Britain. 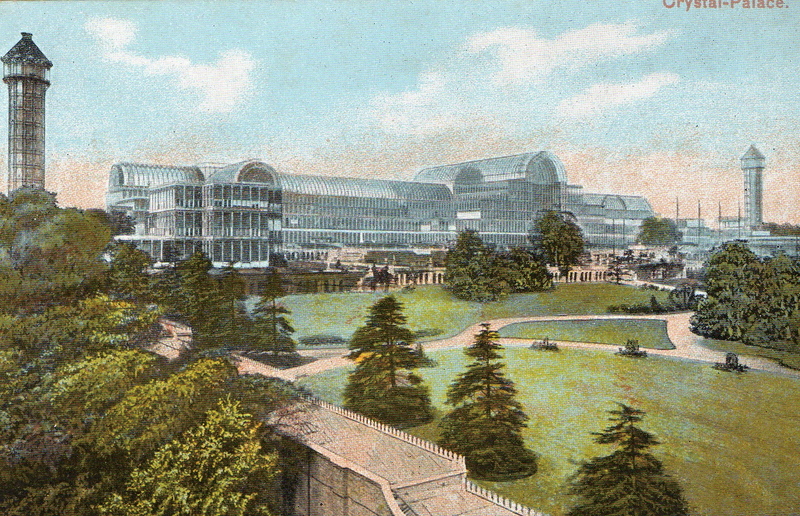 Running from May to October 1908, it was the first of five major international exhibitions to be held in West London at the White City complex, which later gave its name to the area. Over 8 million people attended over the course of the exhibition, including 123,000 people on the first day (and yes it did rain at the opening ceremony!). 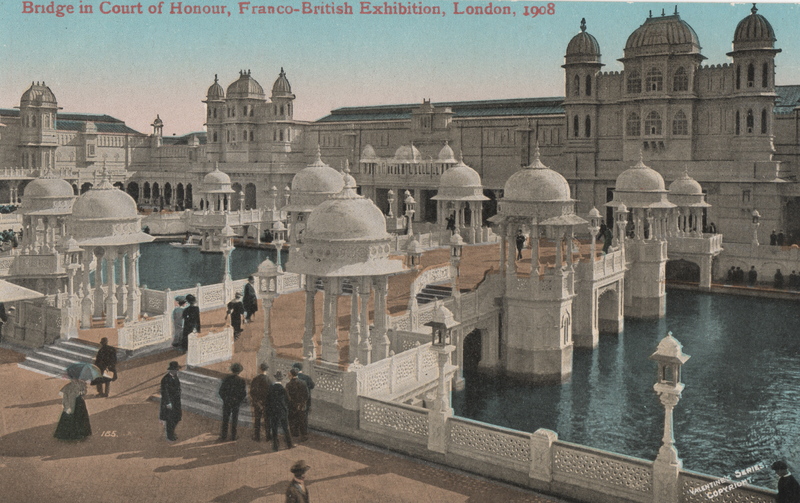 As the delightful images on the cards show, the exhibition contained a number of ornate buildings in the ‘Oriental’ style, complete with plenty of domes and arches. 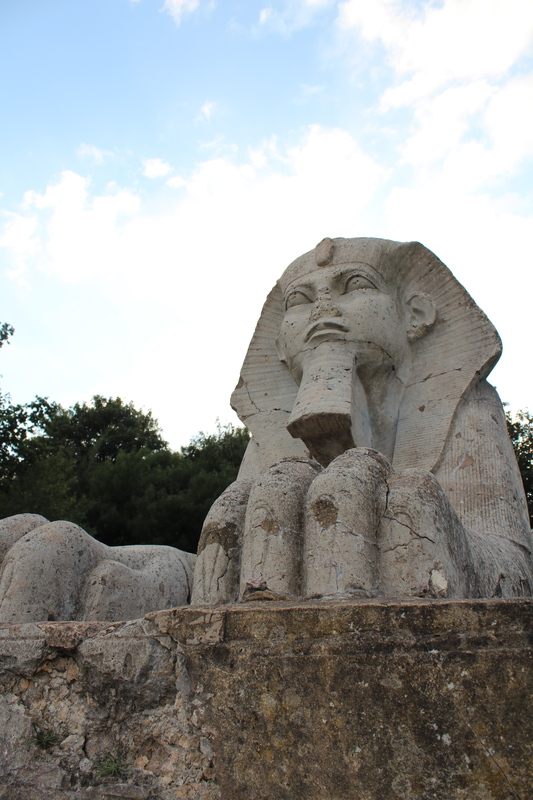 These buildings were covered with fibrous plaster and painted painted white – hence the name White City – to protect them from the weather. Visitors could take boat rides along a central artificial lagoon, while a number of waterways, roads and bridges linked the 120 exhibition buildings and twenty pavilions that were constructed across the 140-acre site – a remarkable transformation of what was formerly farmland. The entertainment on offer for patrons included a scenic railway (featuring fake mountain scenery), fun-fair style rides (including the famous Flip Flap and a toboggan ride), musical events, food outlets and some rather non-PC model villages (in which people became the exhibits). A Tudor house was uprooted from Ipswich and re-built on the site, and scale models of London from the Middle Ages erected so that visitors could experience ‘Old London’. Spectators could also thrill to the sight of an entire town being suddenly swept away in ‘The Johnstown Flood’ – over 715,000 visited this model alone, which required 54 tonnes of machinery to operate. 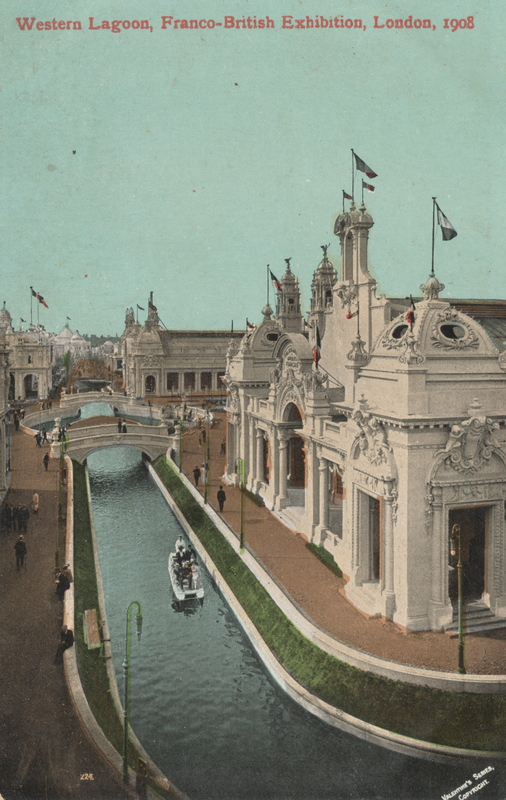 Interestingly, many of the buildings were put to use again for the 1910 Japan-British Exhibition, making for a strikingly similar set of postcards. A future edition of the vintage postcard series will feature that exhibition and discuss what remains of the site and its exhibits. In short, this was sadly very little, but at least the postcards remain to tell the story. So to the second instalment of the Londonphile’s vintage postcard series. This dramatic postcard depicts the events of the night of 30th November 1936 when the Crystal Palace was destroyed by fire. 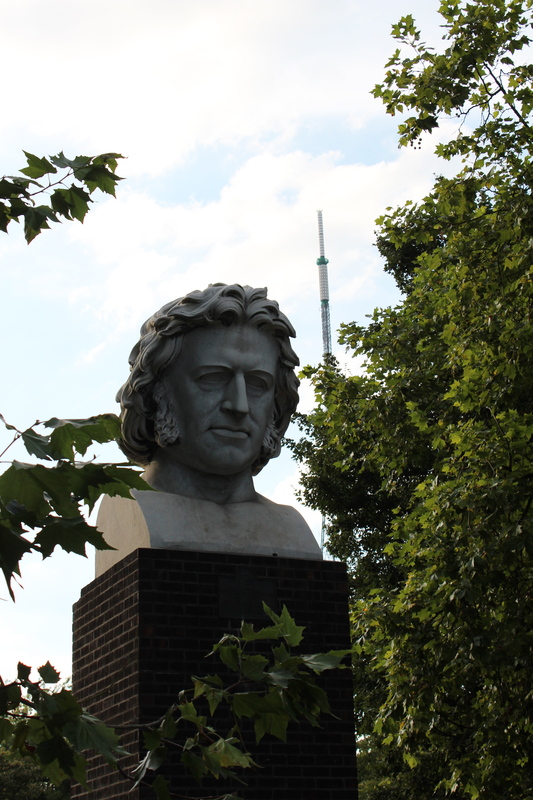 Designed by Joseph Paxton, and made from plate glass and cast iron, this massive greenhouse-esque structure was the former home of the the 1851 Great Exhibition, held in Hyde Park. 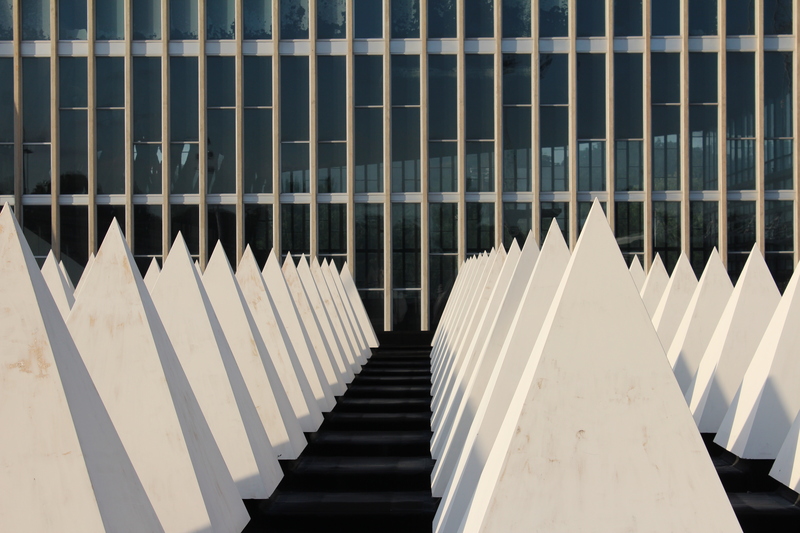 At the completion of the Exhibition there was a quite heated debate about what to do with the Palace. 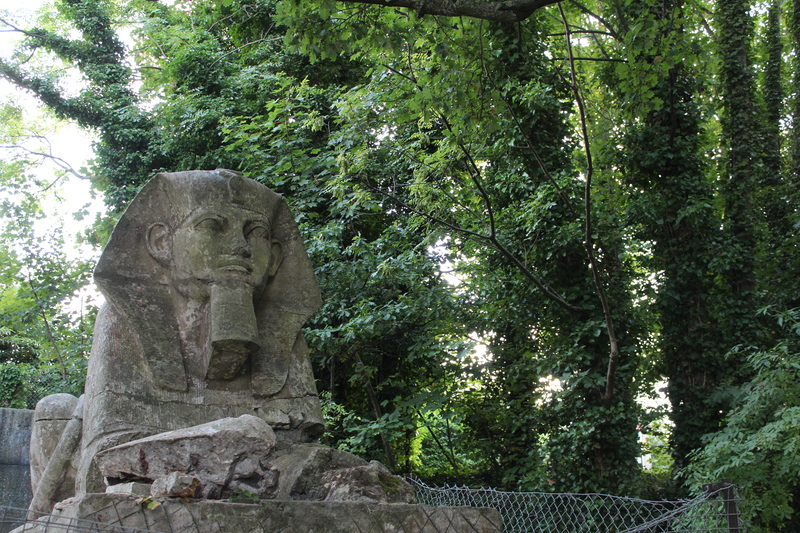 Eventually it was decided that it would be relocated and rebuilt on a much larger scale, and to a significantly different design, in Sydenham Hill – a plan that ultimately cost £1,300,000 (that’s £96.5 million in today’s terms). 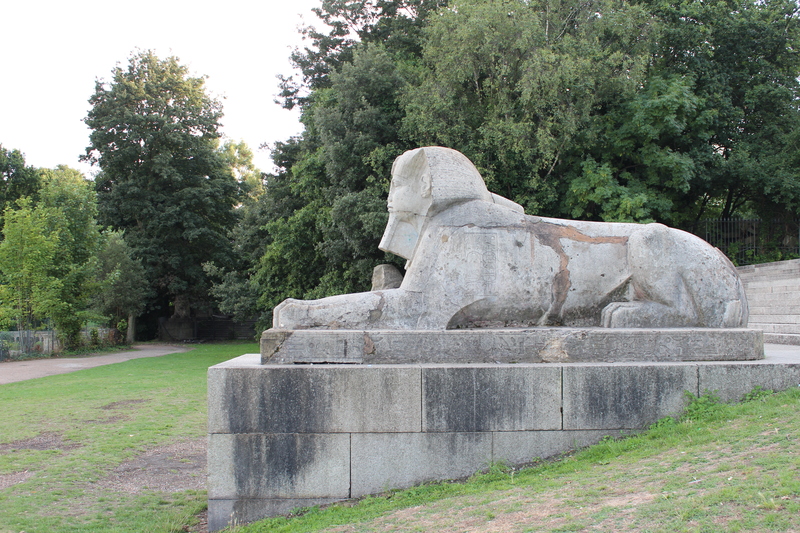 This new version opened in 1854 and was host to numerous concerts, fireworks displays, cat shows and the like. 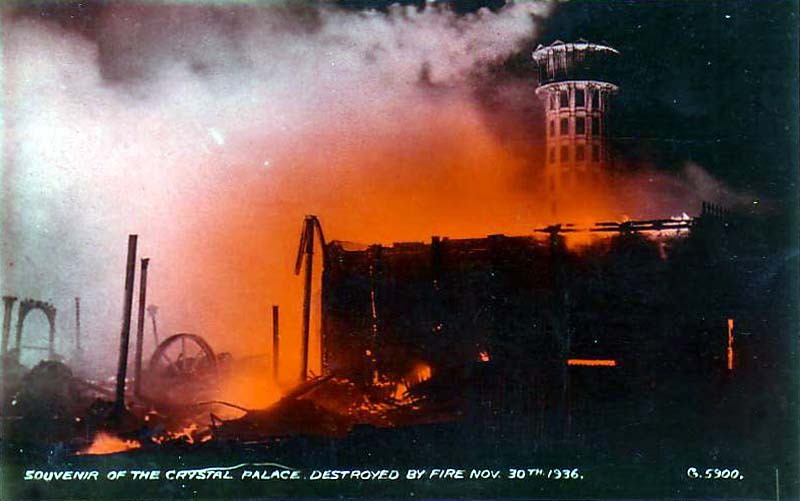 Sadly, despite the efforts of 89 fire engines and 381 firefighters the Palace was lost to the nation in a matter of hours on that fateful night in 1936. Thousands of people, including Winston Churchill, flocked to Sydenham to watch the massive conflagration, while others gathered on higher ground, such as Hampstead Heath, for a view. The glow from the flames was said to be visible from as far away as Brighton and across eight counties. 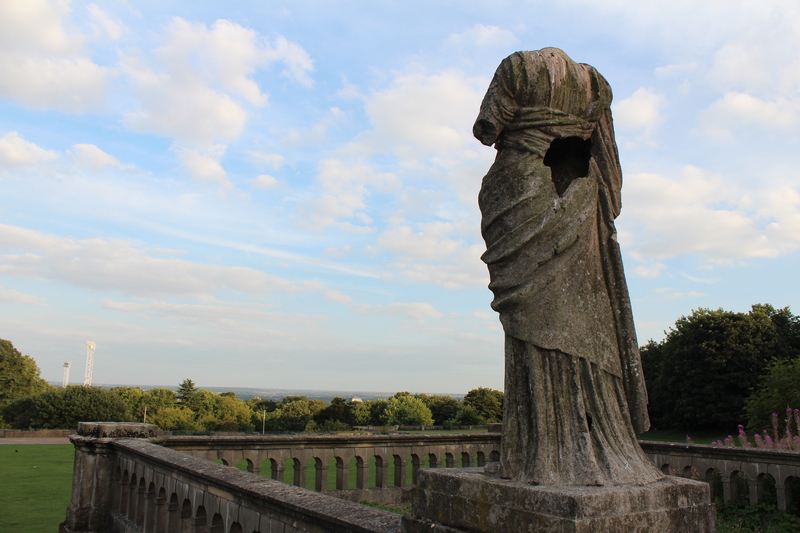 The two giant water towers – designed by Isambard Kingdom Brunel to cater for the massive amount of water that the Palace required for its extensive water features – were the only buildings left standing (you can see one at the back of the picture). 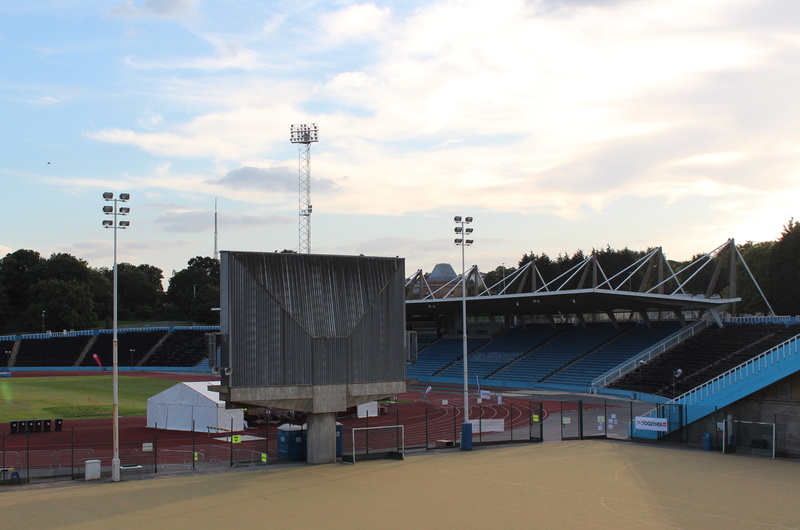 Brunel had been called in for a re-design after the original towers collapsed under the weight of the water. 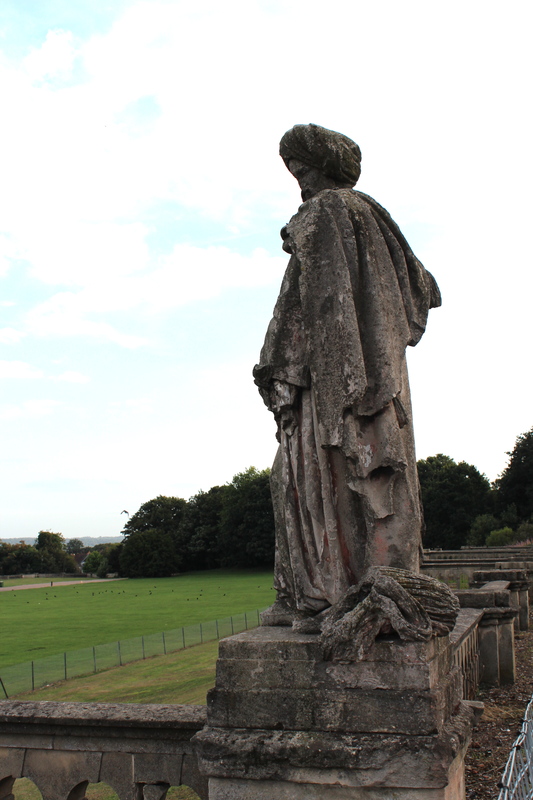 However, even these were later demolished during the Second World War as it was thought that German aircraft might use them as landmarks. The final sting in the tail was that the entire structure was horrifically under-insured for the sum of just £110,000. 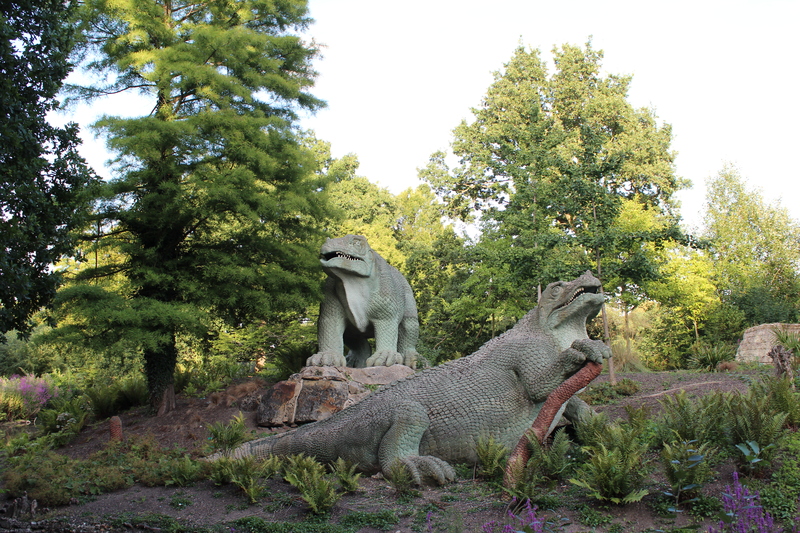 This post serves as a preview of sorts, as I will visit the old Crystal Palace site later in the year and write a more lengthy piece on this fascinating building, its story and what remains today. I love Museums and I love old postcards, so you can see how this post came about. 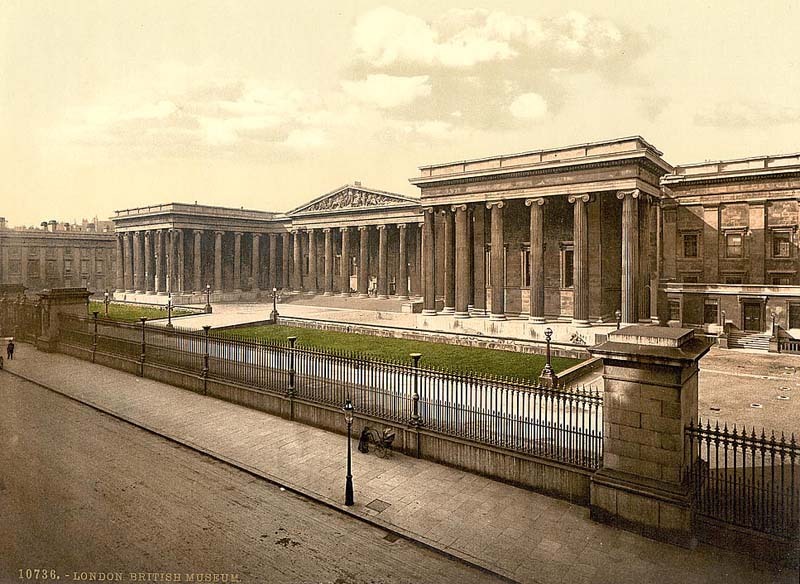 Just a short post so I can share with you the British Museum in all its neo-classical finery (not sure which year this one hails from I’m afraid – please feel free to hazard a guess!). Hope you like it – this will be the first of a series featuring old postcards and images from London.